After five successful seasons as manager of Wisla Krakow, the time has come to pack up and move onto the next part of my managerial career. It has been a successful period for the club as we won four Ekstraklasa titles, one SuperCup and made the group stage of the Champions League. It’s not all been rosy and I’m going to go through the highs and lows in this post and let you know where I’m off to next. It took some time to implement my plans at Wisla. Mainly due to me being blinded by the new tactical creator, but once I focussed on what I wanted my team to do, everything clicked into place. We went on long unbeaten runs, we kept a lot of clean sheets and we scored a lot of goals. I built a team that was fully focused on the jobs I wanted them to carry out rather than building a team of well rounded players. Winning four titles in five years is impressive, but it was the manner of those title wins, especially the final one, that really excited me. We just looked unstoppable at times. In the final season, we weren’t top of the table until eight games remained, then we blew everyone away when the league split, eventually finishing with a 10 point gap at the top. A manager is judged on winning titles (cliché) but overall, the club grew significantly when I was in charge. All training and youth facilities improved, we reached the Champions League group stage which brought an amazing amount of wealth to the club. The bank balance was bolstered and we could bring in much improved players. I did maybe get success a little too quickly for my liking though. I wanted to toil for a couple of years before getting a title, but sometimes that’s just the way of it. Wisla are now the most successful team in the Polish top flight with 17 title wins. It wasn’t all sunshine and rainbows however. As I mentioned, it took time to get things into shape and that was a real struggle. We couldn’t afford to improve the playing squad for at least 18months which meant we had to compromise quite a lot. The board were pretty hesitant to grow the coaching staff at the club which meant we lacked a little bit in training with me covering a lot of aspects of training. I prefer to delegate these things. The Director of Football has been quite useless in the transfer market, which meant that I had to take over transfer duties so I could get the required players in. Finally, two things made me leave. When we finished 16 points clear of second place in my fourth season, I knew it was getting a little easy. I was keeping an eye on the job market but I’d have been happy to sign another contract, but no offer was coming. With me in the final year of my contract and still building my reputation as a coach, I wanted to make sure I had a job for the start of the next year. Sometimes when you apply for a new job, the club will make you an offer and it wasn’t coming. When I did accept the new job (which I’d deferred until the end of the season), this happened. All responsibilities were removed and that pissed me right off. The Director of Football, who I had earlier appointed, set about selling three of my centre midfielders and brought in three right wingers for colossal fees by Polish standards. He spent €19m in the winter transfer window alone. I’d only spent €21m in the previous four seasons. Those deals he did emptied the bank account of all the money I’d built up. Seriously bad business for the club. 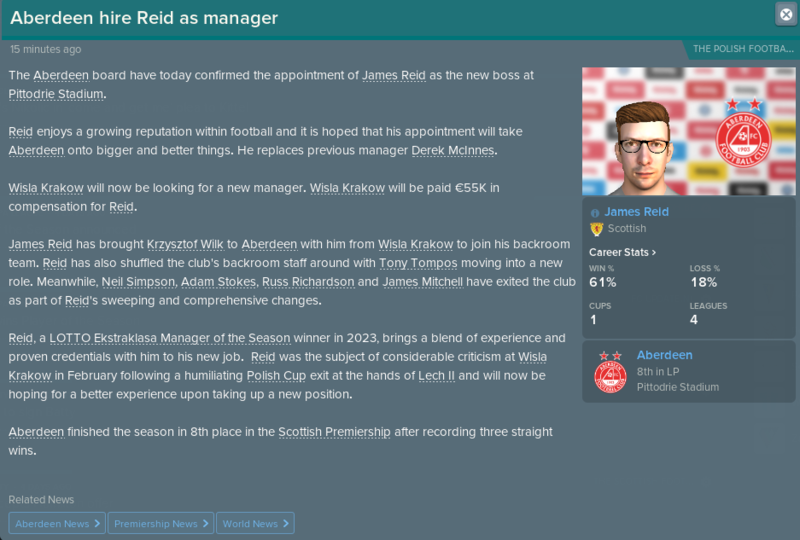 As you’ll have seen above, I’ve got a new job at Aberdeen. I’m from Scotland, but I don’t follow Scottish football and I don’t really have a team I follow. However, since I’m from there, I figure it would be worthwhile doing a few years in Scotland to add to my CV for the future. Aberdeen had finished 4th and then 3rd three times before going totally off the boil last season and finishing 8th. When Derek McInnes was sacked, the club were in 10th place with them looking like they could get relegated. There was a real possibility that I could have been taking over a Championship club, but they did well from that point and managed to claw their way clear. Oddly enough, I didn’t assess the playing staff when I applied for the job as I wasn’t really interested in that. I tend to have a high turnover of players in the first couple of seasons so I’ll asses the club and the players in a future post. So, there we have it, the Polish adventure ends and I get to return home to Scotland to try to turn around the fortunes of Aberdeen. It’s going to be tough to topple the Old Firm, but I’m already looking forward to that! I’m trying to do updates in a different way for FM19, I don’t want to go into every single result or every transfer I do. A little overview of what is happening in the save will be what I’m doing now and it frees me up to continue in my save without pausing to catch up with seasonal updates. I’m going to be switching clubs as I try to move around to hopefully turn things around for sides. I do play quite quickly so I might be at Aberdeen for what seems like a couple of weeks, but that’s a lot of FM time for me. I’ve named this ‘The Final Wisla Update’ but I may go back and do a tactical overview of the team or I might do that with Aberdeen. Hopefully you can stick around for the ride. Thanks for reading.